2.- Bathtub caulking, this step is a sure way to improve the looks of any bathroom old and new. 3.- Repair a leaky faucet. If the tub spout, shower head, shower handles or sink faucet, a leak makes a bathroom look old and screams remodeling! 4.- Remove wallpaper! that’s sooo 90’s. There is no place for wallpaper in today’s bathroom. 5.- Paint. Update dark colors to whites, neutral or light greys. 6.- If you have an outdated pink, blue, green tub and tile color you should refinishing to save the most of your bathroom improvement budget. 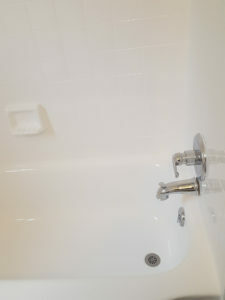 Changing the tub and tile is the most expensive bathroom remodeling option and refinishing will do that for you in one or two days and save you time and money. 7.- Change your tile floor. Again if you have any of the outdated color above mentioned you can change it. Tile is very affordable today, you can get very good deals starting for less than a dollar a square foot or $25 sq, ft material and labor included on average. 8.- Change your vanity, sink and faucet. This one is a biggie and will have a great impact. More storage capacity, looks and overall convenience. 10.- Change your light fixture and mirror or cabinet.